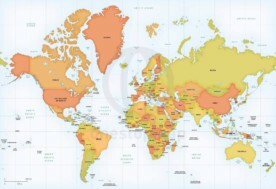 With the 'World Mercator Countries Map Bundle' you are getting a huge discount with a total of 6 printable and editable maps covering the world centered on 3 areas. 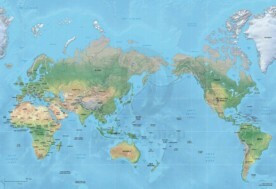 These maps are centered on Europe-Africa, Asia-Australia and America. Save almost 65% with this map bundle. Normal price for all these maps together is $134 (printable option) and $270 (vector option). Maps are made in 2 map styles: Lucid and Summit. 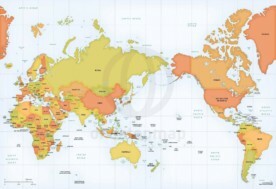 With the ‘World Mercator Countries Map Bundle’ you are getting a huge discount with a total of 6 printable and editable maps covering the world centered on 3 areas. 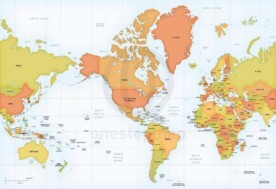 These maps are centered on Europe-Africa, Asia-Australia and America. Save almost 65% with this map bundle. Normal price for all these maps together is $134 (printable option) and $270 (vector option). Maps are made in 2 map styles: Lucid and Summit. The printable and editable world maps in our Lucid style are showing countries with names, lakes, grid and physical features. 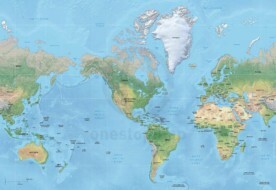 Our world maps in Summit style are showing shaded relief (JPEG XL – 6000px wide – @300dpi), country boundary lines, sea area, coastline, lake, major rivers, grid, name countries, name of ocean/sea. Not shown, but selectable and editable, is the country area. The printable option of this map bundle includes two file formats for each map: XL resolution JPEG photo and PDF. The JPEG is extremely large: 20 in (60 cm) wide – 300dpi. The PDF is non-layered, has no editable text, but is scalable to any size without loss of quality. 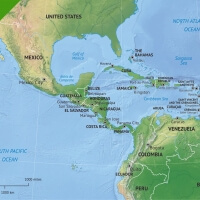 The vector option will get you maps that are extensively layered, editable and accurate. A vector map can easily be scaled up or down to any size you want without any loss of quality. Every map feature is selectable and editable. Text is real text. File formats included for each map: AI-EPS-PDF (Lucid style) and AI-PDF (Summit style). JPEG XL resolution is always included. As part of our support when you buy this map, you can always contact us to retrieve yet another file format. These maps come with a royalty-free license. This means you can use it for personal and commercial use. Your downloads are always available in your account. When the world changes, our maps do too. Map updates arrive in your account automatically. Hi, thanks for the question. 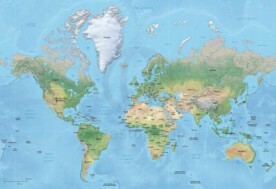 These are world maps in Mercator projection. In the Mercator map projection Antartica would be about the same height as the rest of the world map. It just does not fit. Our other world map projections do include Antarctica, like Robinson projection.